This is a post that I originally shared at Sun Scholars this summer. Now that the school year is well underway and homework time may have lost some of its appeal, I thought I'd share this fun way for kids to practice math facts while they're up and moving around. Spread out your numbered circle mats. 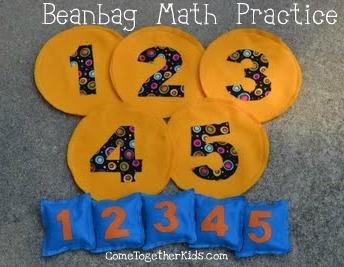 Try to toss each of your numbered beanbags onto the mat with the same number. Players take turns tossing their five beanbags onto the mats, adding up their score as they go. If the beanbags misses the target, no points. If the beanbag lands pattern side up, you get the number of points on that mat. If the beanbag lands number side up, you get the points on the mat PLUS the points on the beanbag! Player with the highest total sum at the end of the round, wins. Version Four + : Do similar games with subtraction, multiplication, sequencing, etc. Trying to hit the target for the most points! 1. Cut 10 circles out of felt. I traced a 9" plate for my circles. It looks like only 5, but I cut two at a time so there are 10. 2. Cut 10 five inch squares for your beanbags. I used felt for one side and a fun fabric on the other. 3. On your computer, find some numbers in a style you like, increase the font to enlarge them, and print them out. 4. Trace the numbers backwards onto the paper side of some iron-on adhesive (I like using Heat n Bond Ultra hold for things I'm not going to sew). Iron it on the wrong side of the fabric you'll use for your numbers. You'll want to trace the numbers backwards so they're right side up when you cut them out. 5. Cut out your numbers and peel off the paper backing. 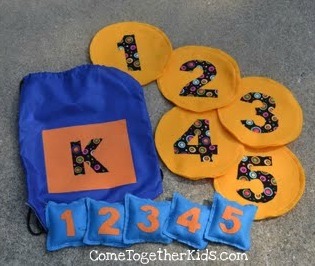 Iron the smaller numbers onto the bean bag pieces and the larger numbers onto five of the felt circles. 6. To make the beanbags, put the wrong sides together and sew two seams next to each other around the edges, leaving an opening to fill the bags. 7. Fill your bean bag with rice. I found a small paper dixie cup worked even better than a funnel ( Plus my kids took my funnel to play with and never returned it to the drawer!). You'll want the bean bag full enough to weigh down your bag, but not so full that you can't stitch up the opening. Filling was much easier with an assistant's help! 8. Stitch your opening closed, again using two rows of stitches. See my old sewing machine? It's as old as I am! 10. I decided to make a little storage bag for our game using one of the free little tote bags my husband picks up at conferences and seminars. That's it, you're all set! You have a fun set of beanbags, target mats and a storage bag. Play a few rounds every once and awhile and you'll be amazed at how quickly those Math facts become automatic. This is seriously fantastic. I love all of your different ways to play! I'm pinning this and sharing it on Facebook and Twitter. Thank you for posting! I hope to make it sometime soon. This is definitely something my son would love to have, just for fun! This is a nice idea..! Great! We use red yellow green bean bags as traffic lights for a lot of running (and stopping games) never thought of numbers on them. I can see this coming to a sewing ,machoine near me soon! This is a great math game idea! I am a teacher and could see this as a math center game or for kids who finish early. Nice! It's something we could get a lot of use of, first recognizing numbers and then beginning to add! I didn't even know there was adhesive that could be ironed on like that! Something else I want to make! Wow! This is great, especially on rainy and cold days like it has been in my neck of the woods lately. My almost 4 year old has been working on number recognition and starting to add. So this is perfect! Love your blog! Found you on Tip Junkie.